Creative Futures is a short-term intensive designed to support the further development of dedicated dance students at the Hamilton Conservatory of the Arts. The program was launched four years ago to provide additional instruction and guidance to students seeking ways to expand their skills and understanding of dance as a language. Creative Futures is open to HCA students aged 11+ enrolled in at minimum three hours of dance class each week OR students who have passed their Level IV (or higher) ballet exams with a Commended (or higher) score in the last school year. As well, selected students will be those who consistently demonstrate exemplary behaviour, including a positive attitude and friendly conduct toward their peers and teachers. Upon acceptance to the program, a fee of $50 is due by the first rehearsal. As this is a program with limited spaces, attendance is required for every class and rehearsal, without exception. Additionally, attendance at regularly scheduled classes is still expected. For more information on the Creative Futures program, please speak with our friendly staff in person, or call 905-528-4020. *Please note: While we strive to maintain the program schedule shared above, HCA reserves the right to make adjustments if necessary. 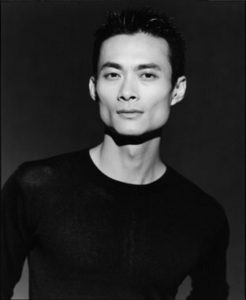 William Yong is a Canadian actor, performer and choreographer who was born in Hong Kong. William Yong’s first passion was music. When he was young, he was a member of a children’s choir and went on to become the lead-singer and songwriter of a music band in Hong Kong/Asia signed by two major record labels. He received his dance and drama training at the Hong Kong Academy for Performing Arts while he was a singer. After graduation, he was twice the recipient of the HK Jockey Club Dance Fund scholarships and chose to further his dance study in the U.K. at the London Contemporary Dance School. He completed his Master’s Degree in dance with distinction validated by and graduated at University of Kent in Canterbury. William’s professional theatre and dance career spans more than twenty-four years since starting in London U.K. in 1994. To date, he has performed in 75 cities within 15 countries. He has created over seventy-six theatre and dance works world-wide. He is the artistic director of Zata Omm. He also works in live productions, theatre, film & television, music videos, and other artistic collaborations. 1. What is the Creative Futures Program? Creative Futures is a short-term intensive designed to support the further development of dedicated dance students at the Hamilton Conservatory of the Arts. The program was launched 3 years ago to provide additional instruction and guidance to students seeking ways to expand their skills and understanding of dance. Students will get to present their works at their very own performance at the HCA Recital Hall. Dancers will also have the change to audition their works to perform on the FirstOntario Concert Hall stage for inclusion in the year end recital. 2. What is the fee to register? For students accepted to the program, a non-refundable fee of $50 will be due by the first Creative Futures session. This fee contributes toward bringing a professional choreographer to work with students, as well as project coordination costs. 3. Are there prerequisites or other requirements I need to fulfill in order to participate? Creative Futures is open to students 11+ enrolled in at minimum 3 hours of dance class each week OR Level IV (or higher) Ballet Students that have achieve a Commendable (or higher) score on last year's exams. As well, selected students will demonstrate exemplary behaviour, including a positive attitude and friendly conduct toward their peers and teachers. 4. What is the time commitment expected of me? As this is a short-term initiative with limited spaces, attendance is required for every class and rehearsal, without exception. Additionally, attendance at your regularly scheduled classes is still expected. Please note all participants will be asked to sign a letter of commitment. 5. How will the program be structured? You will meet your choreographer and teacher in the first class. After an initial evaluation of technique and training, you will either be grouped into two small classes, or combined to do a single group performance. You will work as a team to develop your piece(s), which you will then present as part of “HCA Celebrates,” the year-end recital in June. 6. Can I be removed from the program? Students who miss classes, rehearsals or do not demonstrate appropriate conduct will be asked to leave the program. What if I don't meet the requirements but I really want to join Creative Futures? If you feel very passionately about being part of this, please submit a letter demonstrating your commitment to dance and you'd like to join the Creative Futures Program. The Artistic Director will make final acceptance decisions. Spots for participants are extremely limited. As such, we may not be able to accept everyone who is interested. Priority will be given to senior dance students with a demonstrated record of commitment to the art and practice of dance. Are there any costume fees? For individual routines, dancers will be responsible for creating their own costumes. For the Creative Futures Group Routine (which includes all participants) dancers may be required to purchase a costume totaling no more than $100.